Thor-Delta rocket prepared to launch Landsat 1 on July 23, 1972. 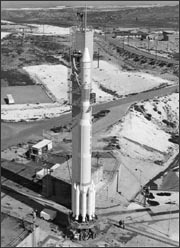 On this date in 1972, Landsat 1 (then known as the Earth Resources Technology Satellite) was launched from Vandenberg Air Force Base. Landsat 1 was in operation until 1978. In the past three and a half decades, Landsat 1 has been succeeded by Landsats 2, 3, 4, 5, and 7… making today the 35th year of continuous Landsat satellite operations.